In this free lesson we’re going to learn how to play piano major scales in all 12 keys. Now, this lesson will be a little different than some of the other beginner piano lessons you may have seen online. Most of those lessons miss the most important part of teaching the major scale. They fail to mention there is any easier way to learn piano major scales. By learning this one simple formula you’ll be able to quickly build and play a major scale in any key on the piano. Lets get started learning this piano major scale formula right now! Why not take 5 minutes and watch this quick piano tutorial. You can watch, listen, and learn as I show you the formula step by step. After you watch it scroll down for additional tips to help you master this piano lesson. 1. The major scale is built from a combination of half steps and whole steps. These are the building blocks of the major scale. Understanding how to put these half steps and whole steps together is very important. 2. Finding the half steps on piano is very easy. Simply go up or down to the next closest note. It does not matter if that note is black or white. Let’s take a look at the diagram above and look at a couple examples. Example: C# is a half step higher than C because it’s the next note up. Example: E is a half step lower than F because it’s the closest note to the left. 3. Finding the whole steps on piano is very easy too. Simply go up two half steps either up or down and you’ve found it. Please also refer to the diagram above and let’s look at a couple examples. Example: D is a whole step higher than C because it’s 2 notes up. Example: Eb is a whole step lower than F because it’s 2 notes down (to the left). 4. 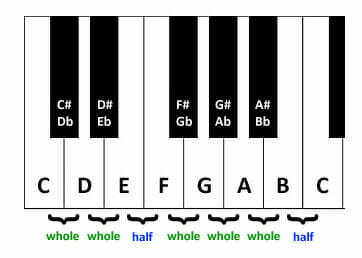 The formula for building the major scale is W-W-H-W-W-W-H. (W= Whole Step, H= Half Step). This is a simple but very important formula in music theory. 5. As you continue to learn more scales and chords you’ll be able to refer to this simple formula as a starting point. You can learn to build many different chords just using the formula we learned here today as a starting point. It will also help you transpose, recognize new musical patterns, create melodies, and learn piano music faster. It’s very useful! 6. If you want to start learning more about how to play with chords right now you can check out this lesson on decorating major piano chords. I would recommend that you memorize the major scale formula. Then, from there you should choose random starting notes and see if you can build a major scale starting from there. Always keep in mind when applying this formula that the note you start on will be the note you end on. So, if you start on Eb than your last note will also be Eb. One last important point is to also use your ear in this process. If you’re unsure how the major scale sounds just take a listen to the youtube video above for your reference point. After teaching piano lessons for 15 years I’ve never met a student who hasn’t at least heard the sound before! 🙂 So, don’t separate your ear from this formula! In future lessons we will discuss the fingerings of the individual scales. Until that time it is very important that you master this formula and the interval building blocks. Happy practicing and have fun!! If you’re new here and enjoyed this lesson be sure to subscribe to the pianolessonsonline email list. You can subscribe on the top right of the site. You’ll be joining a fantastic community of aspiring musicians trying to learn piano just like you. I love your lessons mr. steve. By making an error I got your website. I forget to type in the word ” learn”. But I am glad I did! I started with amazing grace. wonderfull, thank you and go on with the good job. I am very lucky to have the opportunity to subscribe to your website have the chance to learn piano with a good teacher. Thank you so much! How often do you post lessons? Always looking for more. We are going to be posting a lot more in the near future. Thanks Tom! I never knew something like this exist. Finally I rumble on net and found you. Thanks so much. I can’t wait for more tutorials. It was in deed Amazing Grace! Thanks Steve, I have memorized Amazing Grace and Halleluiah and Purple Rain. A real accomplishment. I have never been able to just walk up to a piano and play a song. Especially when we walk into a music store. Now everyone looks at me when I start playing. I had a music teacher when I was a teenager and he told me practice, practice, practice. I’m excited for the new songs you will teach me. That’s awesome Mark. Thanks for letting us know about your progress. Keep up the great work! thanks so much for today’s lesson. pls i need more of this lessons. I’m amazed! you have done what other teachers have fail to teach me in all my 50+ years. I consider myself a beginner after multiple attempts at learning.Now I feel confident that I can learn through your teachings. Thank you for this wonderful site.